If your family is anything like ours, you are not going to be able to stop at just one type of Mandelbroyt. Mandelbroyt, otherwise known as mandelbread, mandelbrod, mandelbrodt, mandelbroit or kamishbrot depending on what part of the world you are in, is a delicious, crunchy and crispy dessert. We've created a variety of mandelbread flavors to appeal to every palate. For detailed information on each flavor and to order, click on the boxes below. Having troubles ordering? Call us at 888.233.1072 or email us at info@papabenskitchen.com. 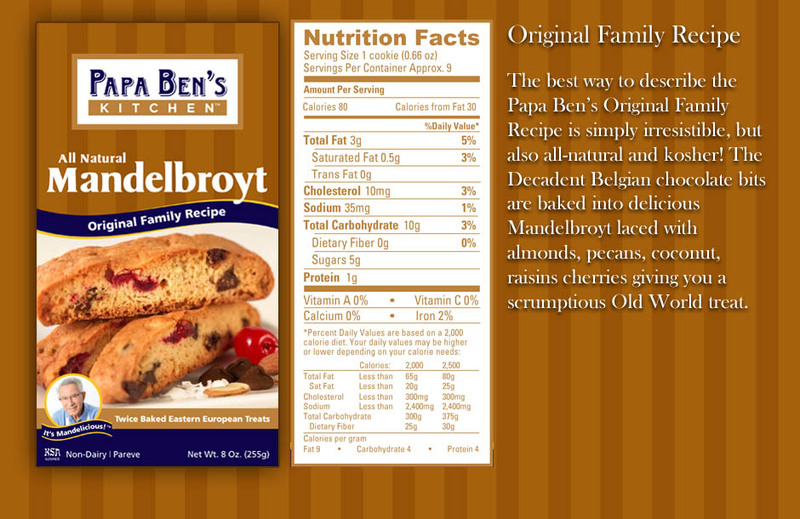 The best way to describe the Papa Ben's Orginal Family Recipe is simply irresistible, but also all-natural and kosher! The decadent Belgian Chocolate bits are baked into delicious Mandelbroyt laced with almonds, pecans, coconut, raisins and cherries, giving you a scrumptious Old World treat. The delectable Minty Dark Chocolate creation blends a cool and fresh sensation with the dark scrumptiousness of a rich chocolate to create an irresistible mouth watering delicacy. 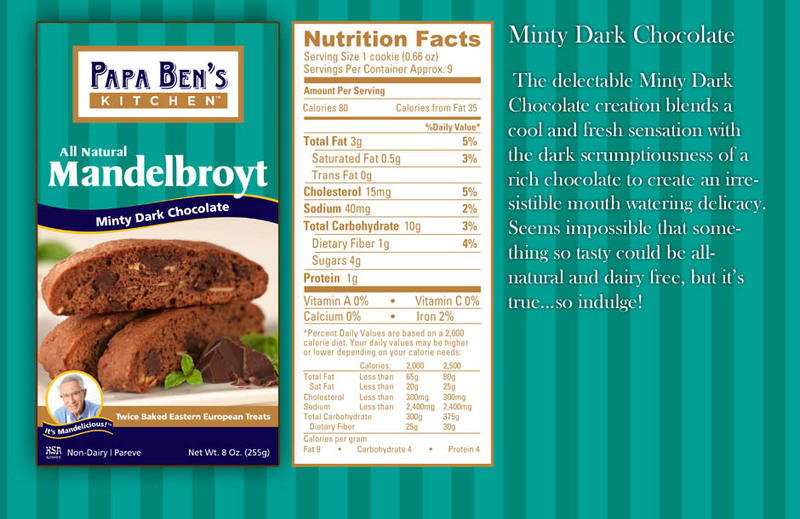 Seems impossible that something so tasty could be all-natural and dairy free, but it's true... so indulge! The new Chocolate Espresso Bean Mandelbroyt is rich yet delicate, and adds just the right amount of bittersweet to your palate. 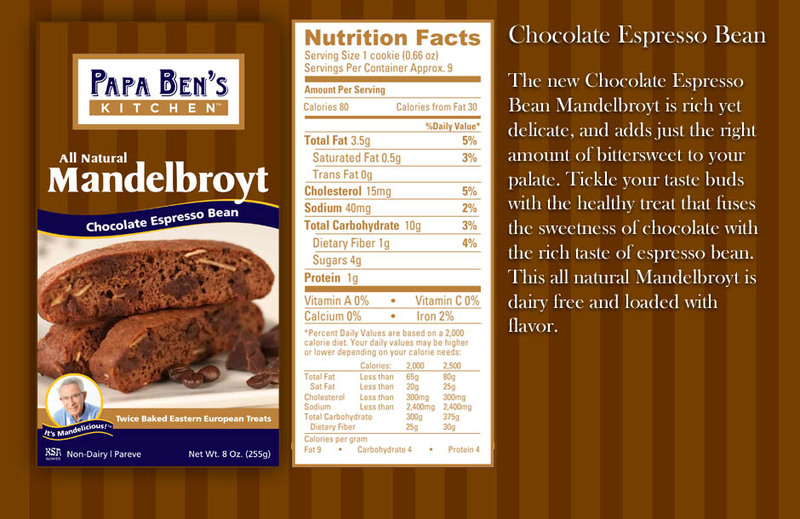 Tickle your taste buds with the healthy treat that fuses the sweetness of chocolate with the rich taste of espresso bean. This all natural Mandelbroyt is dairy free and loaded with flavor. The twice baked Lemon Blueberry with Poppy Seed Mandelbroyt gives off a sweet yet tart fusion of flavor that bursts in your mouth. 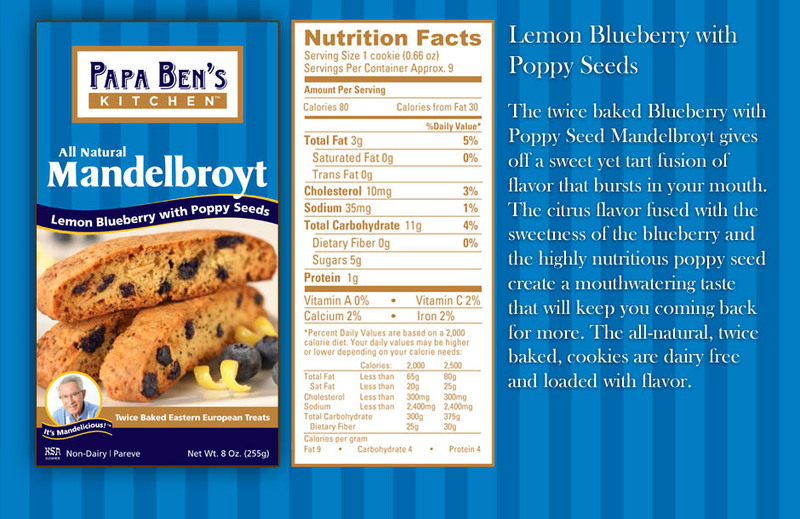 The citrus flavor fused with the sweetness of the blueberry and the highly nutritious poppy seed create a mouthwatering taste that will keep you coming back for more. The all nautral, twice baked cookies are dary free and loaded with flavor. 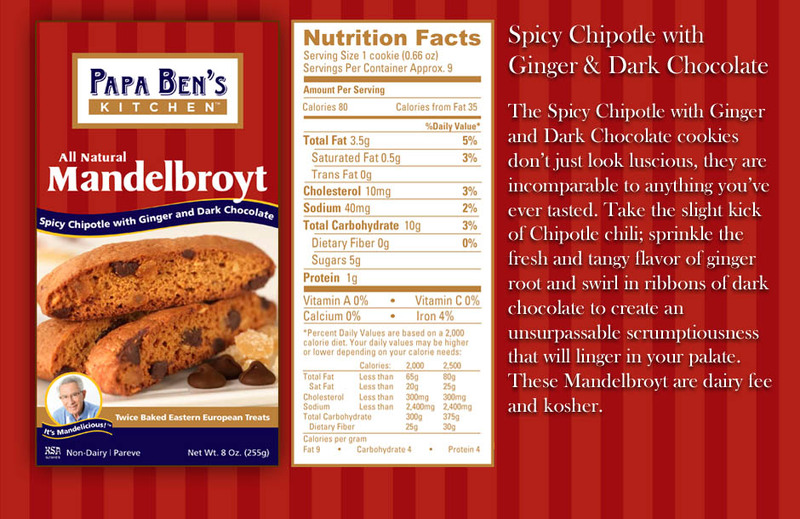 The Spicy Chipotle with Ginger and Dark Chocolate cookies don't just look lucious, they are incomparable to anything you've ever tasted. Take the slight kick of Chipotle chili; sprinkle the fresh and tangy flavor of ginger root and swirl in ribbons of dark chocolate to create an unsurpassable scrumptiousness that will liner in your palate. These Mandelbroyt are dairy free and kosher. In his highly readable, educational and inspiring memoir, Holocaust Survivor Ben Lesser's warm, grandfatherly tone invites the reader to do more than just visit a time when the world went mad. He also shows how this madness came to be-and the lessons that the world still needs to learn. In this true story, the reader will see how an ordinary human being-an innocent child-not only survived the Nazi Nightmare, but achieved the American Dream.